The Faculty Lounge: Theorizing The FLDS Case: Should Texas Terminate Parental Rights? Theorizing The FLDS Case: Should Texas Terminate Parental Rights? Harry Brighouse, a philosopher at UW Madison, has a nice post considering the question of when a state ought to terminate parental rights. (It's based on his article, with Adam Swift, Parents' Rights and the Value of the Family.) He proposes a two-part algorithm. First, have the parents met the preconditions for having fundamental parental rights? Parenting, he argues, provides the parent a particular sort of intimacy which uniquely promotes human flourishing. But when a parent fails to attend to the child's interests sufficiently, he or she loses her fundamental rights to parent. This doesn't end the matter, however, because at this point the child's interest surfaces. Once a parent has forfeited rights, the state must "ask whether terminating parental rights will, given the real institutional alternatives, be better for the kids than not doing so. This bar, frankly, is usually pretty high, because it takes pretty serious abuse and neglect to make a child worse off than they would be in the foster care system." Brighouse then offers three reasons why the foster care option is sketchy: first, it's disruptive to place a kid in foster care against his or her parents' wishes; second, original parents have lots of legal protections that result in kids often being shuttled back and forth between original and foster parents before any adoption can occur; and third, "some foster parents are pretty bad." The fact that original parents have so many protections is, of course, something the State, itself, has control over (as, to some extent, is the quality of the foster care system). Maybe the state should reform the law so that children can easily and quickly be fostered-then-adopted, and original parents have little say. But for these particular children (and the courts making the decision) there is no prospect of law being reformed in that way. And there are reasons, given the history of the US into very recent times, for being very uneasy about giving State governments that sort of power given the history of the use of state power against despised groups of parents in the US. 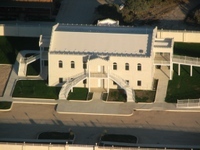 Image of the FLDS compound courtesy of this site.